Win a NVIDIA® TITAN RTX™ GPU! NVIDIA is excited to announce our partnership with Microsoft and Epic Games on the DXR Spotlight contest. 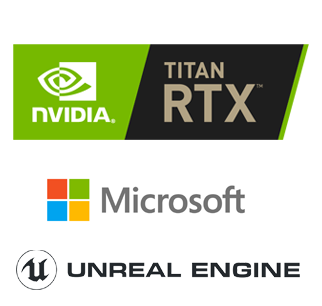 We’re looking for game developers and content creators to create tech demos in Unreal Engine 4.22 featuring Microsoft® DirectX® 12 and DirectX® Raytracing for a chance to win NVIDIA® TITAN RTX™ GPUs. Microsoft® DirectX® 12 and DXR , and the GeForce RTX™ platform bring real-time ray tracing to games for the first time ever. Ray tracing has been considered the holy grail of computer graphics, simulating the physical behavior of light to bring real-time, cinematic-quality rendering to games like never before. We want to see just how creative you can be with Microsoft® DirectX® 12 and DXR! We’re asking content creators/developers to use real-time ray traced reflections, real-time shadows, and/or real-time global illumination in their tech demos. Please submit your tech demo by May 22nd, 2019 for your chance to win. 1. Use Unreal Engine 4.22 to create a tech demo that showcases real-time ray tracing using Microsoft® DirectX® 12 and DXR. Content creators and/or developers must use real-time ray traced reflections, shadows, and/or global illumination in their tech demos to qualify. 2. Submit your application here. a. All applications must be received by 11:59 p.m. Pacific Time, May 22, 2019 to qualify. b. Submissions must be both a YouTube clip (minimum 30 seconds) of the tech demo and a link to the tech demo.